The Souvlaki truck has officially become my new favorite food truck. 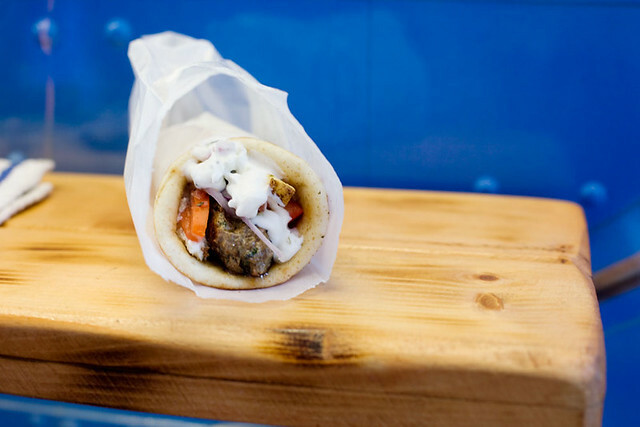 The Souvlaki truck crew are some of the nicest people and they churn out amazing tasty foods. Cooked meat is great, cooked meat on the grill is awesome, cooked meat on grill then wrap a warm pita around it is fantastic! So far I have tried the chicken pita and bifteki sandwich which is grilled ground meat served in a pita with feta, tomato, onion and tzatziki sauce. As some of you may know they won Rookie of the Year at this year’s Vendy Awards. They totally deserved it. Next time I gotta make sure to try the Greek fries.